No bicycling for the cycling gal this week. I did get some great workouts though. Two one hour workouts on the cross trainer at the gym, a spin class another night and two great cross country skiing workouts this weekend. My husband and I went out to western MA for a family get together and stopped at Notchview Reservation on the way. Notchview is our favorite cross country skiing spot. 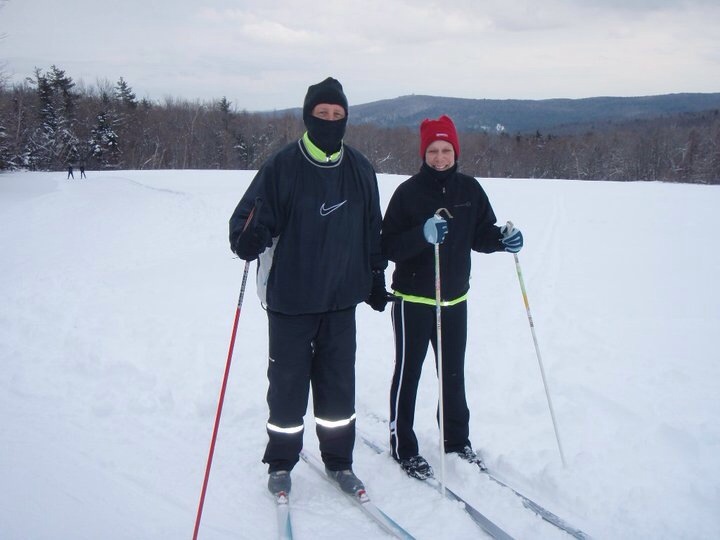 We drove home this morning and skied at the nearby Wachusett Reservior, which is surrounded by protected land with many woods roads and trails that are perfect for this winter sport. A friend recently commented that cross country skiing “looks exhausting”. She’d been watching the Olympic Nordic skiers which is a different style of cross country skiing referred to as skating. We don’t do that. I agree it looks exhausting. We chug along in the classic style which is much slower. The movement is very close to using a cross trainer or elliptical machine at the gym. Either way, cross country skiing is a great workout. However, I can’t wait to ride my bicycle regularly! I wonder how many of my readers bring their lunch to work? Or do you get take out? Maybe you have a cafeteria that offers an array of items for sale? I bring my lunch to work. It’s cheaper and I eat healthier. I make a batch of something healthy on Sunday night and bring it to work every day. I don’t mind eating the same thing every day. 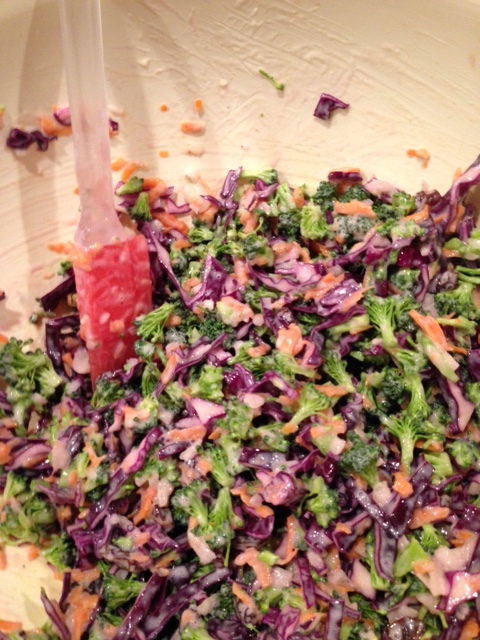 Today I made broccoli cole slaw. I’ll also bring an apple, some mixed fruits and a bowl of broccoli cheddar soup. Among other nutrients, this cole slaw is high in potassium. Did you know a diet rich in potassium can lower systolic blood pressure (the upper number) by up to 8 points? You don’t need to take potassium pills to get enough to lower your blood pressure. A diet rich in fruits and vegetables will give you all you need of this mighty mineral along with a myriad of other health benefits ranging from lowering the risk of cancer to avoiding constipation. Taking potassium isn’t known to reduce the risk of heart attacks. But by making sure you’re taking in enough potassium, you’ll probably end up eating more fruits and vegetables. A healthy diet high in fruits and veggies and low in saturated fat and cholesterol, can help cholesterol levels and reduce the risk of heart disease. If your blood pressure is bordering on high and your doctor is talking to you about taking medication, you might think of upping your potassium intake and lowering your blood pressure naturally. Place all veggies in a large bowl. In a small bowl whisk dressing ingredients together then add to veggies. Mix to coat. Enjoy! Would you consider sponsoring me for the 35th Pan Massachusetts Challenge? On August 2nd & 3rd over 5,000 riders will bicycle up to 192 miles raising much needed funds for cancer research and care at Boston’s Dana Farber Cancer Institute. One hundred percent of rider raised funds go straight to Dana Farber’s Jimmy Fund. This will be my 11th year riding the Pan Mass Challenge and I’m looking to make this year my best and have set a goal of $10,000. If you’d like to learn more about the Pan Mass Challenge click here http://www.pmc.org. If you’d be so generous as to sponsor me click here https://www.pmc.org/egifts and my ID is JS0126. Checks can also be accepted and if you’d like to mail a check send me a message and I’ll supply my address. Do you like avocados? Seems we either love them or hate them. No one I asked said “They’re ok”. I didn’t think I liked avocados. Like many foods that I’d tried when I was younger, avocados did nothing for me. Perhaps the one time I tried one it was too ripe, which gives it a slimy feel. Texture is important to some people and I’m one of them. Perhaps I didn’t like them plain; I still don’t. I recently started hearing more and more about the health benefit of this Mexican fruit that is always in season. Things I heard weren’t just from the news or something I read online, but from people who love them. One man I work with told me his doctor told him an avocado a day would keep your liver healthy. I expressed my distaste for the fruit and he suggested I try eating it mixed with other foods, that avocado would take on the flavor of foods it was mixed with. This conversation led me to start reading about the health benefits of this green pear-shaped fruit from our neighbors south of the border. Avocados are a powerful cancer-fighting food. They contain phytonutrients and antioxidants, both of which fight cancer. Many people avoid avocados because they believe them to be fattening, but they contain monounsaturated fat, a “good” fat that lowers cholesterol and has many other benefits. Half an average-sized avocado contains about 12.5 grams of fat. When eaten with an otherwise low-fat meal, one can keep the fat grams to a minimum while reaping the maximum health benefits of this fruit. Just take a look at what avocados can do! Avocados have more of the carotenoid lutein than any other consumed fruit. Lutein protects against macular degeneration and cataracts, two disabling age-related eye diseases. One cup of avocado has 23% of the RDA of folate. Studies show that people who eat diets high in folate have a much lower incidence of heart disease than those who don’t. 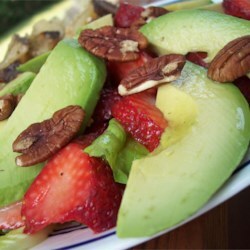 The vitamin E, monounsaturated fats, and glutathione in avocado are also great for your heart. The high levels of folate in avocado are also protective against strokes. People who eat diets high in folate have a much lower risk of stroke than those who don’t. Well when I learned all this I decided I need to add avocados to my diet. After experimenting with a few recipes I found online, these two are the ones I like best. I’ve tried incorporating these recipes into my lunches at least every other week. Now, about cycling…. *sigh*….can I just say snow, snow, snow! Ok, it’s February. It snows in February. I know that. A gal can hope though, can’t she? I am still enjoying cross country skiing and doing so helps keep my cycling muscles strong. Being that today is President’s Day, I had a three day weekend which meant I could enjoy the great outdoors three days in a row. Fifteen miles of wooded trails over three different areas of MA have felt my skis this weekend! Notchview Reservation in Windsor, MA, in the Berkshire Mountains, has 25 miles of groomed trails and the conditions were perfect on Saturday. Sunday on our way home from the Berkshires we stopped at another favorite spot in Templeton, MA where snowmobile trails abound. Snowmobile trails make good cross country ski trails due to the grooming affect of the snowmobiles. Today, staying closer to home, was alongside the Wachusett Reservoir; a favorite spot with the locals. This is my passion. On August 2 & 3 I’ll be riding the 192 mile route of the Pan Mass Challenge. Every penny raised by riders will go directly to the Jimmy Fund at Boston’s Dana Farber Cancer Institute. My goal in life is to help eradicate cancer and I feel this is how I can help. Besides keeping me healthy, my bicycle is a tool in the fight against cancer. Last year I raised $8,700 for the cause. My goal this year is $10,000. Would you consider sponsoring me? You can do so at http://www.pmc.org and click on “donate” then enter my name, Jackie McCrillis in the search field. This will bring you to my fund raising page. Last weekend it was warm enough to bicycle. Then around mid week winter came back with a vengeance dumping 14″ of snow in central MA. Bicycles back into the basement, out come the cross country skis again. We cross county skiing at a land reserve area around a nearby reservoir. We chugged along for 5 miles along the edge of the frozen expanse, along woodland trails and roads. We were fortunate to see a couple of woodland residents; two deer were feasting on tree branches and were fairly unconcerned about our presence. Then we got a little closer and they decided to make a quick exit into the forest. Fresh air and a good workout – a combination I love! So about broccoli. It’s good for you. We’ve all been told that. But exactly why is it good for you? Let me try to explain in simple terms. First of all, it is best steamed. Steaming has been shown to do a better job of preserving nutrients than other cooking methods. I use a steamer basket and in a 3 quart saucepan with enough water to come just to the bottom of the steamer. Stems need a little longer so I put those in first and cook for a couple minutes, then add the florets for five minutes. Because plain broccoli isn’t my favorite I like to dress it up a little. Try tossing it with a couple tablespoons of Dijon mustard and sprinkling about 1/4 cup of cheddar cheese over it. Pop it into the microwave for a minute to melt the cheese and voila! It’s also good with a little fat free Italian dressing drizzled over it. Exposure to toxins in foods we eat, water we drink, the air we breathe, poor general health, dietary deficiencies, use of prescription and over the counter medications and lifestyle choices can make our inflammatory systems work overtime trying to overcome these toxins. If our bodies can’t keep up and detoxify these toxins, the result is called chronic inflammation. When our bodies are overwhelmed day in and day out with chronic inflammation, many other metabolic balances can get thrown out of whack, including the balance in our oxygen metabolism. An unwanted imbalance starts to occur in which too many overly reactive, oxygen-containing molecules are formed. This condition is called oxidative stress. The increased presence of these overly reactive molecules can do damage to many parts of our cells, including their genetic material. Over time, the constant DNA damage inside our cells can pose a risk factor for conversion of healthy cells into cancerous ones. We end up with a combination of inadequate detoxification of toxic substances, chronic inflammation and oxidative stress that puts us at greater risk for developing cancer. Studies have shown our inflammatory response can be significantly suppressed by compounds found in broccoli and actually help to shut down the genetic machinery used to produce components of the inflammatory system. Broccoli is very high in vitamin C. This antioxidant vitamin can provide longer-term support of oxygen metabolism in the body if it is accompanied by flavonoids that allow it to recycle. Broccoli has many such flavonoids in large amounts, including the flavonoids kaempferol and quercitin. Also concentrated in broccoli are the carotenoids lutein, zeaxanthin, and beta-carotene. All three of these carotenoids function as key antioxidants. Broccoli enhances detoxification by altering the activity of the toxins and preventing insufficient detoxification of dangerous substances that threaten our cells. The combination of antioxidant, anti-inflammatory, and pro-detoxification components in broccoli make it a unique food in terms of cancer prevention. Connections between cancer development and oxidative stress, chronic inflammation, and inadequate detoxification are so well documented in the research that any food improving all three of these metabolic problems would be highly likely to lower our risk of cancer. In the case of broccoli, the research is strongest in showing decreased risk of prostate cancer, colon cancer, breast cancer, bladder cancer, and ovarian cancer. We expect that risk of other cancer types will also be shown to be reduced from regular consumption of broccoli. Did you follow that? If so, how much broccoli do you think you’d need to eat to reap its benefits? How about 1/2 cup a day? You don’t want to eat broccoli every day? How about a good sized serving of broccoli a couple times a week? If you consume the equivalent of 3 1/2 cups of broccoli per week, your body will reap the benefits of of its cancer prevention properties. So, eat up! On August 2 & 3 I’ll be riding the 192 mile route of the Pan Mass Challenge. Every penny raised by riders will go directly to the Jimmy Fund at Boston’s Dana Farber Cancer Institute. My goal in life is to help eradicate cancer and I feel this is how I can help. Besides keeping my healthy, my bicycle is a tool in the fight against cancer. Last year I raised $8,700 for the cause. My goal this year is $10,000. Would you consider sponsoring me? You can do so at http://www.pmc.org and click on “donate” then enter my name, Jackie McCrillis in the search field. This will bring you to my fund raising page. Berries – a Super Food! You won’t find many foods that are better at fighting cancer than berries. 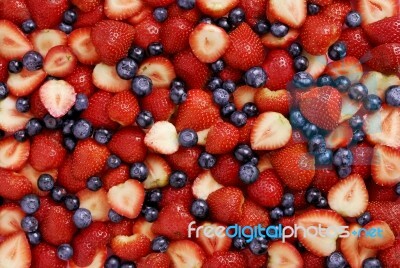 Strawberries and blueberries are the two most popular berries. They’re easy to find and fairly inexpensive. Most strawberry lovers know that a serving contains a lot of vitamin C. In fact, one cup of strawberries supplies you with 150 percent daily value of vitamin C. Talk about nutrient density! That’s a lot of vitamin C for only 50 calories. Strawberries are also relatively high in fiber. But can they prevent cancer? There is evidence that they just might. Two years ago, data revealed by researchers at Ohio State University’s Comprehensive Cancer Center concluded that seven common berries, including strawberries, prevented certain cancers from developing in rodents. The findings of the Ohio State study suggest that it’s not necessary to spend a lot of money on exotic berries, such as acai, to derive the same cancer-fighting benefits. Free-radical fighting compounds called anthocyanins are the all-star health components of strawberries. Anthocyanin pigments are anti-carcinogenic and berries that have a deep red color like strawberries or deep blue, such as blueberries, tend to be high in these anthocyanin compounds. Strawberries are also rich in another natural antioxidant compound called ellagic acid. How about memory loss? According to researchers at Harvard’s Brigham and Woman’s Hospital. In a study published in the Annals of Neurology, berries — including strawberries — can delay cognitive impairments by up to 2.5 years. Blueberries also rank right up there with their health benefits. Second only to strawberries in terms of U.S. berry consumption, blueberries are not only popular, but constantly rank near the top in terms of their antioxidant capacities among all fruits, vegetables, spices and seasonings. Studies suggest that blueberries may reduce memory decline, may reduce heart attack risk, and may provide other anti-aging benefits. They are also an excellent source of vitamins C and K, manganese and a good source of dietary fiber. One of my favorite ways to enjoy these tasty berries are in a smoothie. I add the strawberries and blueberries to the blender along with some Greek yogurt, fat free milk and a dollop of raw honey. Delicious! This was our lucky weekend for bicycling opportunities! 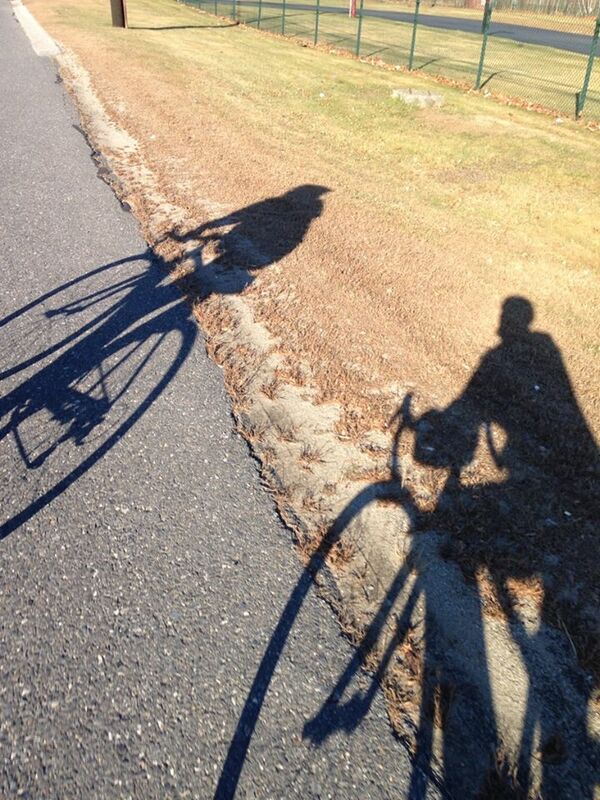 Despite being early February we had unseasonable warm temps and just warm enough to ride. Twenty nine miles Saturday and 24 miles Sunday were the totals. I have to say Sunday’s ride turned sour half way through when un-anticipated showers can into the area. We got soaked. It happens sometimes. According to the meteorologist we’re back to winter weather this week. I’m thankful to have had the opportunity to ride. The cycling high point every year for me is the annual Pan Mass Challenge. This year will be my 11th ride with the PMC and I am proud to be a part of it. The 192 mile two day bike-a-thon raises millions of dollars every year for cancer care and research at Boston’s Dana Farber Cancer Institute through the Jimmy Fund. Last year I raised $8,700. My goal this year is $10,000. One hundred percent of the money raised by riders goes to the the cause. Would you consider sponsoring me with a donation? This is a link to the donation page; https://www2.pmc.org/donation.asp and enter my rider ID JS0126. Before I talk with you about tea, I want to say how much I miss riding my bicycle this time of year. There’s nothing like a nice long ride. It’s a great work out and I often spend the time on my bike pondering life’s dilemmas and working things out in my mind. I find it soothing. However, I do continue to work out through the winter and one of the ways I do is I teach a Spin class at my local fitness center, Ciccone Family Fitness. Once a week on Tuesday evening for an hour I lead a class of mostly women up and down imaginary hills and flat roads. We sprint, climb and race our way through a great cardio workout. I love teaching this class and the group of women who join me really seem to enjoy the class. During the winter months, Spin is a good way to keep my bicycling muscles strong. I exercise regularly no matter what time of year. Besides keeping me trim and fit, regular exercise can ward off Alzheimer’s Disease. My paternal grandmother died from this disease. The fact that Alzheimer’s can be hereditary concerns me. Physical exercise is essential for maintaining good blood flow to the brain as well as to encourage new brain cells and thereby protect against those risk factors for Alzheimer’s and dementia. It also can significantly reduce the risk of heart attack, stroke and diabetes. Growing evidence shows that physical exercise does not have to be strenuous or even require a major time commitment. Aerobic exercise improves oxygen consumption, which benefits brain function. Aerobic fitness has been found to reduce brain cell loss in elderly subjects. Moderate aerobic activity lasting about 30 minutes daily gets the body moving and the heart pumping. Every morning on my way to work I drink a cup of tea with honey and cinnamon. I use two tea bags; one green tea and one black tea. The honey is local raw honey that I find at farmers markets or farm stands. My cinnamon is ceylon cinnamon, not to be confused with cassia cinnamon which is the most common type. 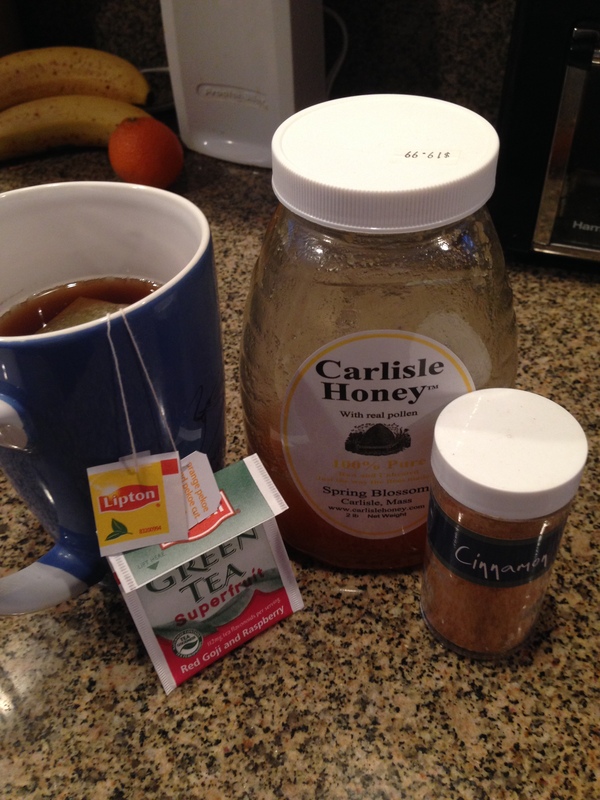 I make my tea in a large to-go cup and drink this combination of ingredients because of the health benefits each provides. Let me break these down for you. Many different studies have found a link between drinking tea and preventing cancer, including skin, breast, lung, colon, esophageal and bladder cancer among others. Studies suggest green tea may lower the risk of breast cancer and prevent it from spreading in women who already have it. Tea contains powerful antioxidants that help to fight free radical damage to the cells, a condition known to increase the risk of cancer. Tea may also boost the body’s immune system and help to cleanse the body of harmful, cancer causing toxins. It may help aid in cancer treatment. All types of tea contain flavonoids, a powerful class of antioxidants. Flavonoids are particularly noted for their ability to cleanse the body of free radicals, support the cardiovascular system and prevent cancer and other diseases. They may also slow the effects of aging. I sweeten my cup of tea with raw honey. Many of the substances that make honey so good for the health are lost through the various types of processing that most honey undergoes. This includes heating and the skimming of bee resin, which is full of highly nutritious phytonutrients. What are phytonutrients? Phytonutrients are natural chemicals that are found in plant foods.These chemicals help protect plants from germs, fungi, bugs, and other threats. Phytonutrients aren’t essential for keeping you alive, unlike the vitamins and minerals that plant foods contain. But when you eat or drink phytonutrients, they may help prevent disease and keep your body working properly. Honey is best consumed raw if you want to get the most out of it for your health. Many of the substances lost during honey processing have been shown to have anti-cancer and anti-tumor properties. These phytonutrients are thought to be particularly useful against colon cancer. Honey contains enzymes and antioxidants proven to fight viral and bacterial infections such as bronchitis, flu, cold, cough and sore throat. Raw honey contains an even richer density of these substances than processed honey. Taken daily, the many phytonutrients and antioxidants provided by raw honey are believed to offer great support for the immune system. Raw honey can also boost energy levels through its supply of natural carbohydrates and sugars. One study found that smelling cinnamon boosts cognitive function and memory. Hmmm…think I’ll take a whiff before I shake it into my tea! Who would have thought that a cup of tea could have so much power! I’ve never blogged before so please bear with me as I learn the ropes! I welcome your suggestions, comments and constructive criticism. My favorite pastime is bicycling. I like to bicycle with my husband, with friends and by myself. I bicycle a LOT! In 2013 I logged just over 2,700 miles. I ride after work during the summer months and on weekends, weather permitting any time of year. I typically do over 100 miles a week during the summer. Riding my bike keeps me healthy and fit. I do not set a fast pace. I don’t care about being the first one there, yet I’m not the last one to arrive either. Shadow photos are interesting. This is my husband and I. When riding a bicycle you see so many more details of the countryside than when zipping by in your car. There’s no hurry and you can take the time to see the sights. We often go to different areas of the state on weekends to bicycle; Cape Cod, the Pioneer Valley and the Berkshires are favorite areas. A couple of years ago my husband and I cycled across the state of MA from the upstate NY line to Provincetown, the tip of Cape Cod. It took five days and we rode 50-60 miles a day. We stayed with friends, family and a couple of hotels. It was a great way to see the state and a memorable adventure! Every year during the first weekend in August I participate in an annual bike-a-thon, the Pan Mass Challenge. Over 5,000 cyclists come together to ride the 192 mile route raising awareness and funds for cancer research and care at Boston’s Dana Farber Cancer Institute. This year will be my 11th ride with the PMC and I will surpass 50K in fundraising. If you’d like to learn more about the PMC check it out at http://www.pmc.org. I’ll write more about the PMC at a later date. The purpose of my blog is to help you learn about things you can do to lower your risk of contacting cancer and keeping your body healthy through diet and exercise. I’ll be the first to admit I don’t always eat healthy. I do enjoy food and alcohol moderately and I love to have fun. But I also eat a variety of foods that have the potential to help keep cancer, heart disease and other illnesses and diseases at bay. Combined with regular exercise can lead to a healthier you. I’d like to share what I’ve learned with you!